Our eBook 12 Days Of Tri Tip Recipes was simply borne out of a necessity to support those interested in making tri tip barbecue with a succinct listing of variations in tri tip that could be made over a 12 day period. The 12 days allows you to select a recipe, study up on it then collect the needed ingredients and when the time is right go out and grill. This eBook we believe is an absolute must for the avid Tri Tip Griller. If you like Tri Tip and enjoy cooking it like I do then get these collected tri tip recipes. The eBook is setup to be used on a one recipe per day basis. 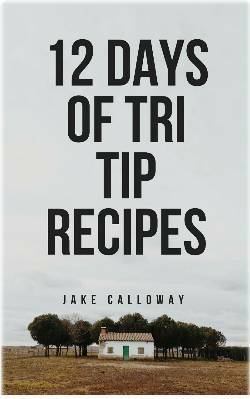 From Culinary style recipes to Basic Quick and Dirty Tri Tip recipes this eBook makes the perfect guide for anyone wanting to make Tri Tip. Tri-Tip Roasts are often labeled the "Santa Maria steak". Although especially popular in California - it is now becoming to be better known in other states as well, and is thus increasing its popularity. Tri-Tip is a lean, boneless, economical cut of meat from the round and bottom sirloin of the cattle. It is great grilled, or marinated and then grilled. Tri-tip roasts will vary from 1 1/2 to 2 pounds and are about two inches thick. If a roast is cooked to rare in the center, the thinner outside edges are medium to well, offering perfectly cooked beef for every taste. The tri-tip can be cooked whole or cut into one-inch thick steaks or strips. The above is a simple and quick Tri Tip recipe that almost anyone can make. All it takes are a few key ingredients that you may have at home if not then almost any grocery will have them. Blend the ingredients together and following the instructions for grilling your Tri Tip. Not only will you get great Tri Tip recipes but we've also included a chart for mapping each Tri Tip cooking season and Bonus Tri Tip Recipes! !